You'll be £14.99 closer to your next £10.00 credit when you purchase Hitler's Sky Warriors. What's this? Order within the next 4 hours, 33 minutes to get your order processed the next working day! During the Second World War, the German Fallschirmjger (paratroopers) carried out many successful and daring operations, such as the capture of the Belgian fortress at Eben Emael in 1940 and the invasion of Crete in 1941. 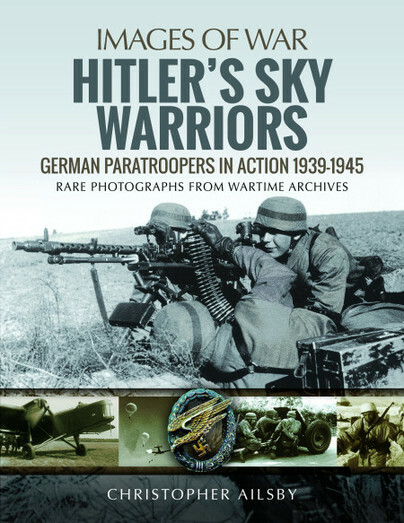 Hitler's Sky Warriors is a detailed examination of all the battles and campaigns of the Third Reich's airborne forces, illustrated throughout by many previously unpublished photographs. Hitler's Sky Warriors includes detailed accounts of all the ground campaigns of the parachute divisions, especially in Italy, where their epic defence of Monte Cassino entered military legend. As well as being a comprehensive account of Fallschirmjger battles and campaigns, Hitler's Sky Warriors includes information on the specialist weapons and equipment developed for Germany's airborne forces. These include the paratrooper helmet, the FG 42 automatic rifle, the so-called 'gravity knife', the different jump smocks, parachutes and harnesses, transport aircraft and gliders. Hitler's Sky Warriors also contains biographical details on all the main parachute commanders, such as Kurt Student, Bernhard Herman Ramcke and Richard Heidrich, and includes appendices that contain information about divisional orders of battle and Knight's Cross winners. In this way Hitler's Sky Warriors builds into an extensive and exciting account of one of the elite formations of military history. An excellent reference for collectors of the Fallschirmjäger. A good all-round aide to visualising the main German parachute operations in WWII. The German Fallschirmjager achieved a remarkable reputation during the Second World War, first as the pioneers of airborne warfare, achieving spectacular success in Norway, the Low Countries and Crete, and then as elite ground-based infantry in the bitter defensive battles which took place across North Africa, Italy, France and Russia. Beginning with their pre-war origins and training, this unusually large book in the Images of War series presents a photographic history of all of these engagements, with a particular emphasis on Italy and their defence of Monte Cassino; one of numerous battles where the Fallschirmjager proved themselves as thoroughly dependable and highly skilled fighters. Detailed captions accompany each photograph, which have been carefully selected to show a broad range of situations and also their uniforms and equipment, some of which were highly specialist and unique to them. Originally published in 2011, this book provides a well-researched and comprehensive survey of Germany’s formidable fallschirmjäger, the elite airborne forces who served in almost every theatre of WW2 where German troops were involved. The author describes the emergence of the two types of airborne forces: the parachutists themselves, who after the usual quarrel between senior officers (including Göring) were formed as part of the Luftwaffe; and the airlanding troops, who, although also initially trained parachutists, were delivered to the battlefield in transport aircraft, usually after the landing grounds had been secured by the initial parachute envelopment. The latter were formed as Army battalions. This is a salutary tale it must be said, and one that makes this a great book and well worth investing in. The WW2 historian will enjoy this one, and for modellers there is a lot to like. Christopher Ailsby is an expert on the Third Reich, the military awards of the Third Reich and the German Armed Forces in the Second World War. The owner of an unrivalled photographic archive on all aspects of German life in the twentieth century, he is the author of several best-selling books on the period, including Combat Medals of the Third Reich, Hitler's Black Guard at War, SS: Roll of Infamy, SS: Hell on the Eastern Front and Waffen-SS: The Unpublished Photographs. He currently lives in the east of England.